I've thought about this long and hard. Well, not really. But it took some decision making. To blog is to keep myself updated, to rant, to have a portal to just talk crap and have crap talked back to me. I enjoyed it very, very much. But if it is not apparent enough, I have, clearly, lost whatever passion I have for the Japanese entertainment industry. I still collect those dramas, which, in time, I will watch. I am not sure if I am as excited. I going to turn 22 In a few months' time. I wonder if more bubblegum pop is what I need. I just am not as excited anymore. It happens with me, every year or two. I fall head over heels into an obsession, and then one day, I wake up, and it is gone. Just like that. A week ago, I woke up, and then I have decided that maybe I don't care about Arashi's AU CMs. I've also decided that I do not want to even watch any of the dramas of this season except "The Quiz Show" and "Mr. Brain". And I don't even watch Himitsu no Arashi-chan except for the mannequin parts where Sho's failures are mildly entertaining, albeit a bit repetitive. Arashi, another new single? Yeah, sure, what is it their 339th this year? It is gone. I figured I just leave this blog be. But then I realized, oh people read! I am still very excited that people read. I never had a blog that is read by people I don't know. But, I guess, when the passion is not there, it shows in the passages. They're just lame recaps and criticisms that might not even be all that true. I looked back at the recent entries, they're just... boring. I figured, I'll just put an end to the blog. Make it something from the past. ^^ I am a bit OCD, so if I don't say I won't update again, I'll have this voice in my head going "You gotta update all your blogs, you gotta update all your blogs. ALL!" So don't waste time coming back, if indeed anyone comes back at all. I do get relapses, but they are just different. A long time ago, my first phase should have been Hollywood movies and then it was Japanese Rock, then came Taiwanese dramas, then it was Lord of the Rings (Yes, I was a ringer), then a relapse of Hollywood movies, then came Japanese dramas,then came Dong Bang Shin Ki, then came Johnny's Jimusho. Of course, for me to actually decide to bid goodbye to one, I must have a replacement. They might be old, retired, or dead. But they still qualify for an obsession. And they were so great once, I have much to learn about them and the genre. 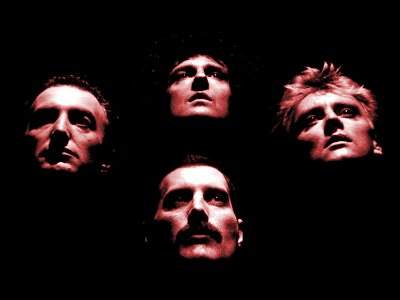 "Scaramouche, Scaramouche, will you do the Fandango". OMG I am so obsessed. Farewell, old obsessions of the Asian world. I shall go now and dive into the 70s-80s British rock scene.